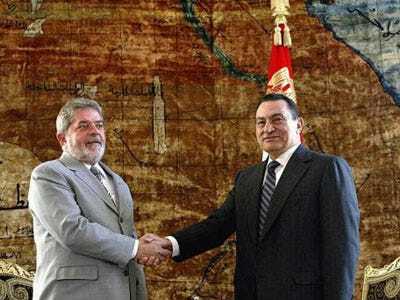 This weekend, we noted widespread Arab-world rumours that Egyptian President Hosni Mubarak had died. There’s no evidence that it’s true, but traders are obviously freaked out. BusinessWeek: EFG-Hermes Holding SAE, the biggest publicly traded Arab investment bank, dropped the most since December. Telecom Egypt, the largest fixed-line operator in the Middle East, slumped the most since October 2008 after posting full-year earnings that missed estimates. The EGX 30 Index’s 3.8 per cent retreat was the most among 93 indexes tracked by Bloomberg. The retail market is “feeling a little nervous about the president,” said Angus Blair, head of research at Cairo-based investment bank Beltone Financial. “When he returns, I guess you get more calmness.” The benchmark index lost 6.2 per cent in the past three days, the most since Nov. 30. The EGX 30 closed at 6,353.14, with all 30 stocks declining.